I follow actor Rahul Kohli on Twitter, he plays Dr Ravi Chakrabarti on iZombie, and he can be quite amusing indeed while he swears at everyone and everything like a drunken sailor. One of the things he will often reference is how much he wants to play the character of Kitster in a Star Wars movie. You remember Kitster, he was Anakin’s childhood friend in Mos Espa on Tatooine. I don’t think he’s entirely serious, but neither would he turn it down if it was offered him. 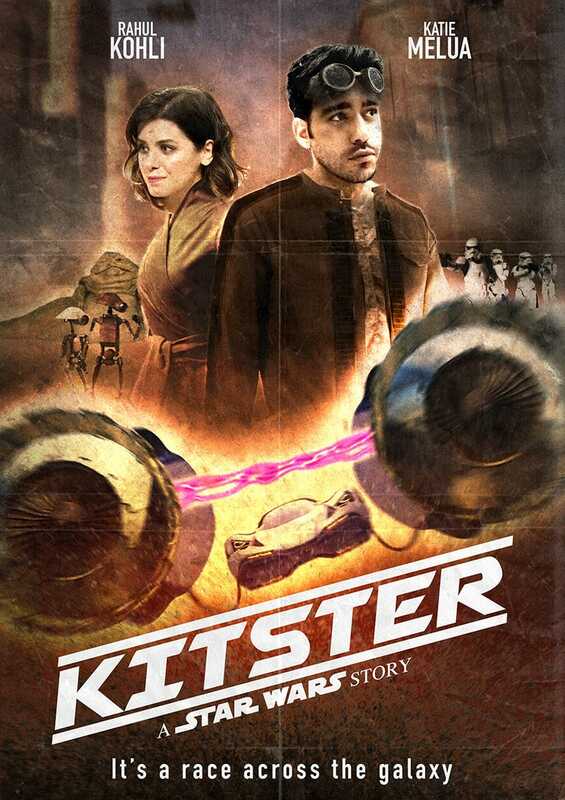 And I figured that, unlike in the obsolete Expanded Universe, Kitster would have continued on as a Pod Racer and his story would be about competing in the Galactic Championships. So I made him a movie poster, starring him and singer/actress Katie Melua (who you probably don’t know, but she is somebody I have long had an affection for). I posted an earlier version of this poster to Rahul, and he reposted it so that now I have had hundreds of Likes tear up my Notifications. I’ve never had such a reaction before, it will skew my statistics like crazy.